Warsaw, Poland. Can I even begin to tackle sharing and explaining the beauty and complexity of this Eastern European city? I’m not 100% sure I can get this done in just a couple of posts, but I will try. Warsaw is Poland’s capital city and is situated in the heart of the country. If you’re on a quest for immersing yourself in European history, surrounding yourself with diverse architecture (both old and contemporary), or eating delicious goods to your heart’s content, go to Warsaw. There are no ifs, ands, or buts. Pack your bags and go. Before I jump further into this post, I have to add in a bit of a disclaimer: I hold Warsaw close to my heart. Warsaw is where my parents, grandparents, and great grandparents came and come from. I grew up on stories of growing up in Warsaw going generations back. Before I was 9, I knew about life during the war, life behind the Iron Curtain, and life after from those who had lived through it. Polish was my first language. Polish soil was the first European soil I ever set foot on after my first transatlantic flight from Canada. The Lonely Planet’s caption for Warsaw is “a story of rebirth,” and I wholeheartedly agree with this statement (you can see the Lonely Planet’s page on Warsaw by clicking here). Warsaw once enjoyed days of splendour and opulence where paintings by Dutch and Italian masters hung along palace walls. Yet, the end of World War II almost decimated the city. But please note that Warsaw is a remarkable phoenix, and it’s heart kept beating through the ashes and the limitations placed upon it during the following 45 years. It kept waiting for the opportunity to rise up again and share its magnificence and resilience with the world…and so, it has. I first set foot in the country in 2000 – about a decade after the collapse of Soviet power in Poland. I have also returned to Warsaw numerous times during the last two years. I have no personal experiences from before the year 2000 to compare my upcoming statement to, but during the last 16 years, the city has undergone a remarkable transformation, and I can tell you that it’s not quite finished yet. Today, the city stands proud and tall with towering, flashy and architecturally fascinating skyscrapers filling its downtown core. There are no shortages of trendy restaurants, bars or shops, wonderful gardens and revolutionary museums in Warsaw. The city is one of innovation and endless possibilities…and possibly, by the end of my Warsaw posts, it will find a place in your heart too. 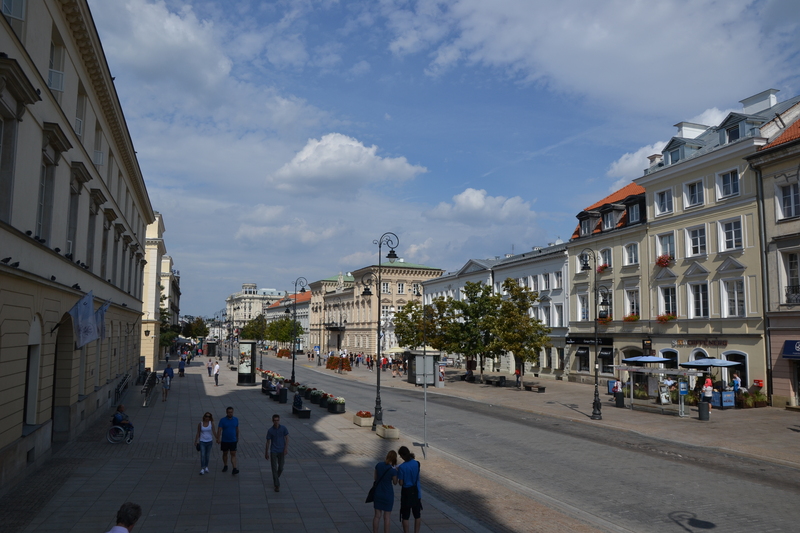 I had originally intended to write one post about Warsaw, Poland. However, after seeing the final word count, I decided to split it into two. I simply had a lot to say and many photos to share of this unique city. 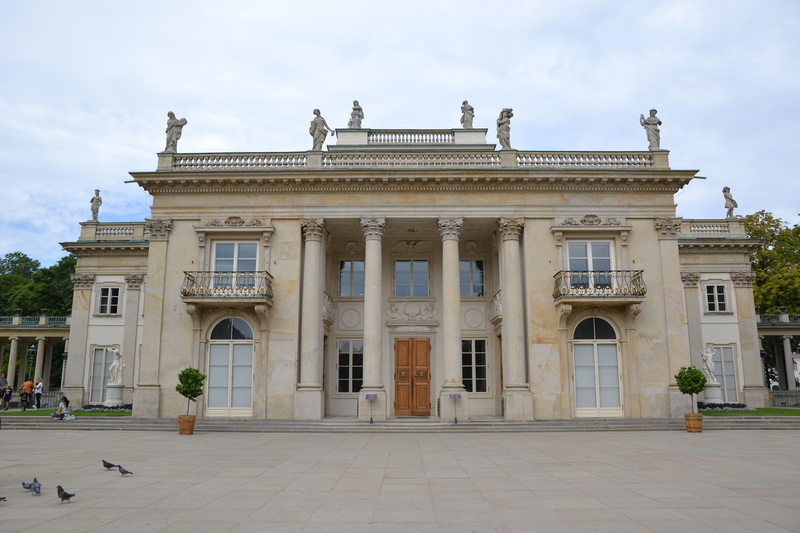 While this post covers the Royal Łazienki Park, the Warsaw Rising Museum, and Nowy Świat, next week’s post will share more info about Warsaw’s Old Town, the Palace of Culture and Science, and Polish cuisine. All places listed in these two posts aim to provide visitors with a scenic and historically informative experience of Warsaw. If you wake up and discover it to be a bright and sunny day, go on a stroll through Warsaw’s Łazienki Królewskie. This park is what Central Park is to New York City and so much more. 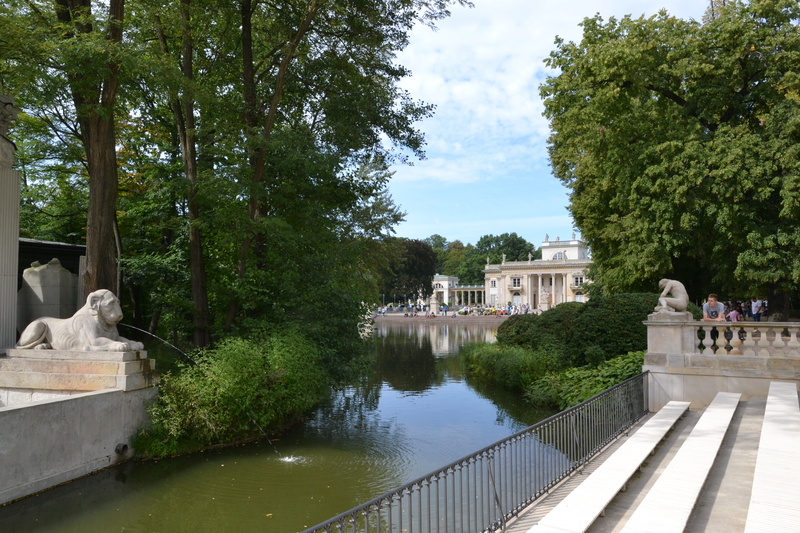 Łazienki park is located about 2 km from the city centre and can be easily reached by public transportation or by foot. In the park, you can enjoy nearly 1 square kilometre of beautiful gardens, paths, cafes, monuments, an amphitheatre, palaces, and other historical buildings. Many of the buildings in the park are also home to historically significant paintings, prints and other documents. A view of the Palace on the Isle from the park’s amphitheatre. To give you a bit of background info, the park was King Stanisław August Poniatowski’s (1732 – 1798) summer residence in the late 18th century. (He was the Polish-Lithuanian Commonwealth’s last king). He was a great supporter of the arts and Polish Enlightenment, and his residence reflects his dedication to patronage. For instance, in the Palace on the Isle, (which was a bathhouse prior to King Stanisław’s purchase), you can find walls filled with paintings by Dutch and Italian artists painted centuries ago. The palace walls were even once home to a painting by the world-renown Rembrant van Rijn. Even though the buildings in the park were severely damaged during the Second World War, great effort and care has been taken during the last couple of decades to restore them to their former glory. For those of you interested in history, a room in the Palace on the Isle has a display of photographs showing the extent to which the palace was destroyed during WWII. It also provides an overview of the restoration process. Ultimately, Łazienki Królewskie is the place to go if you want a taste of Polish history and to explore the country’s artistic and architectural splendour before the World Wars. During my last trip to Warsaw, I went into the Palace on the Isle for the first time. The exterior and interior were simply impressive. Only later did I find out that the palace was modelled after older Italian palaces/villas, such as the Villa Borghese found in Rome. Incredible! Entry costs 25 Polish złoty (but 1 złoty for children and students under 26). …and snapshots of the the even more exquisite interior. 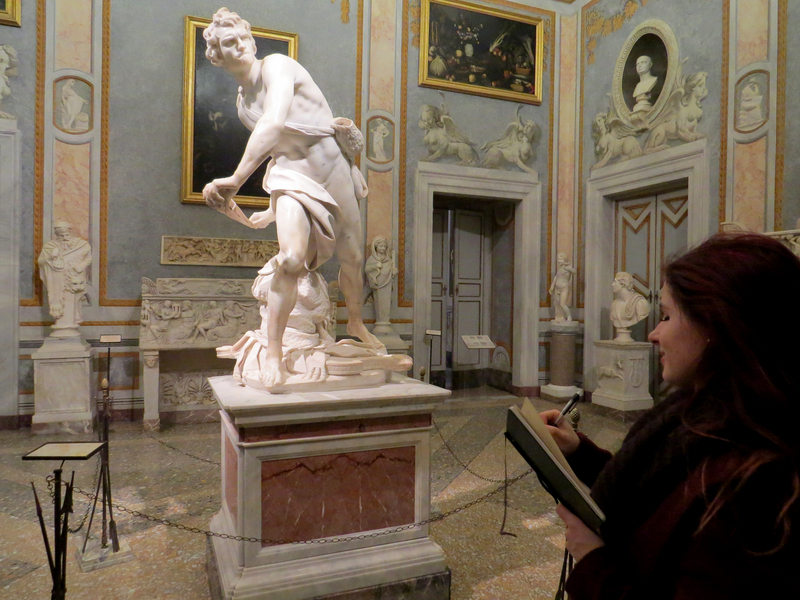 Here’s a snap from inside the Villa Borghese for comparison. Yes, I love to draw. In another section of the park, you can find a huge statue of Poland’s famous 19th Century composer, Frédéric Chopin. On Sundays in the summer, you can come and listen to outdoor instrumental concerts between 12 and 4 in the afternoon. Of course, only Chopin’s music is included in the repertoire. 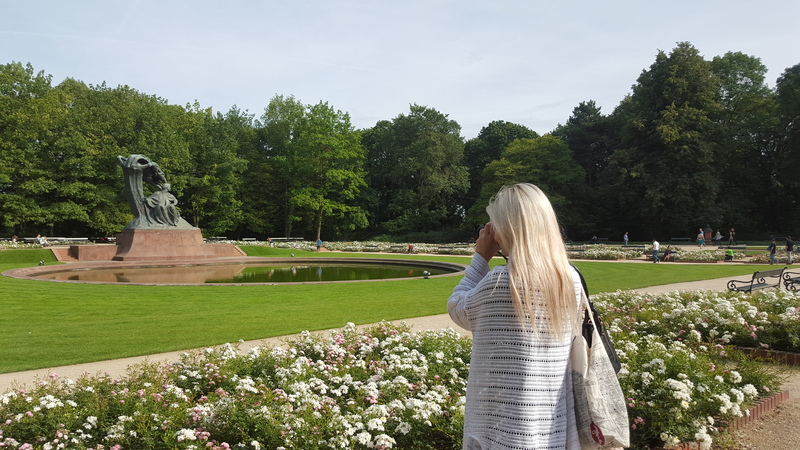 Taking a photo of the Chopin statue. Thank you for the candid shot, Grams. For more information about the Royal Łazienki Park, please see the park’s website by clicking here. Even if you’re not a history buff, I would highly recommend paying a visit to this museum. Here’s why: if you devote some time to wandering the streets of Warsaw, you may come across some rather unique sights. You may see impressive, new skyscrapers standing right next to half-standing, deteriorating buildings. You may see rows of closely built housing with unexpected empty lots of land appearing right beside . You may see ornate buildings with a hint of what seems to look like Parisian “Belle Époque” design next to simple concrete blocks. A visit to the Warsaw Rising Museum will explain why you are seeing such a diverse assortment of architecture or none at all. When it comes down it it, it can all be explained through the city’s history. On August 1st, 1944, during the Second World War, the Polish Resistance Home Army launched an attack in an effort to defeat German forces in the city and put an end to German occupation. The Uprising lasted for 63 days, and the resistance did not succeed. By the end of the Uprising, almost the entire city of Warsaw had been destroyed. Some historians claim that this destruction of Polish and German forces and Warsaw’s architecture and infrastructure paved the way for Soviet occupation. The museum was created to commemorate the lives, courage, hope, pride, and resilience of the hundreds of thousands of Polish soldiers and civilians who lost their lives during the Uprising. The museum is made up of many multi-media exhibits that explore every aspect of the Uprising. Exhibits consist of videos, primary documents, artifacts, interactive displays, and short simulations in order to give one an in depth understanding of this critical moment in Warsaw’s history. Entrance costs 18 Polish złoty, and please note that museum is closed on Tuesdays. While I have spent a great deal of time in the Warsaw Rising Museum, I have yet to visit the Neon Museum and the Museum of the History of Polish Jews. They are on my itinerary for future trips to the city. Nowy Świat and Krakowskie Przedmieście are names for a part of a main road that runs for roughly 2 kilometres in the centre of Warsaw. 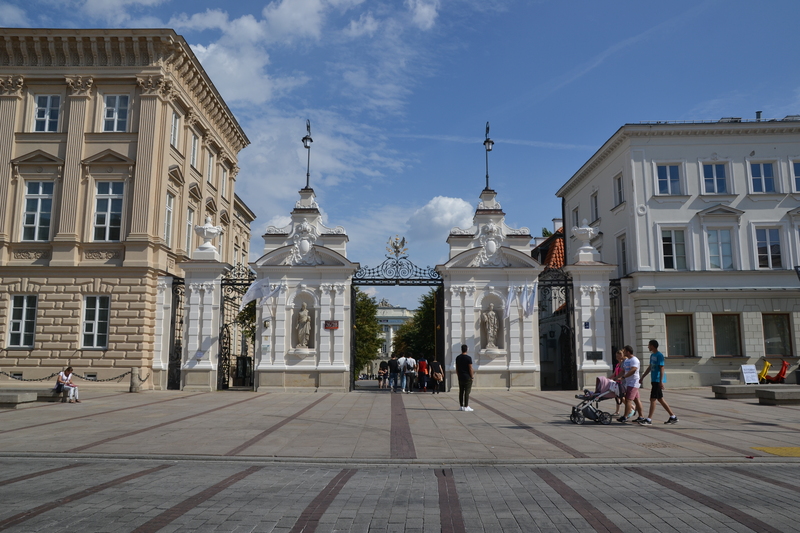 Along this road, you will find many historical sites, such as the Copernicus monument, and places of contemporary significance, such as the downtown Warsaw University campus. You will also find many lovely cafes, restaurants and shops. (A.Blikle in the area has delicious Polish pastries called pączki). The placement of this road is hundreds of years old, and at the northern end of it, you will find Warsaw’s Old Town (stare miasto). It’s also useful to note that as you approach the northern end of this road, the name changes from Nowy Świat to Krakowskie Przedmieście. This road was heavily impacted by the Uprising. Everything you see has been rebuilt during the last 70 years. Entrance to the Warsaw University campus. A Bird’s-Eye View of Krakowskie Przedmieście with more contemporary skyscrapers along the skyline. 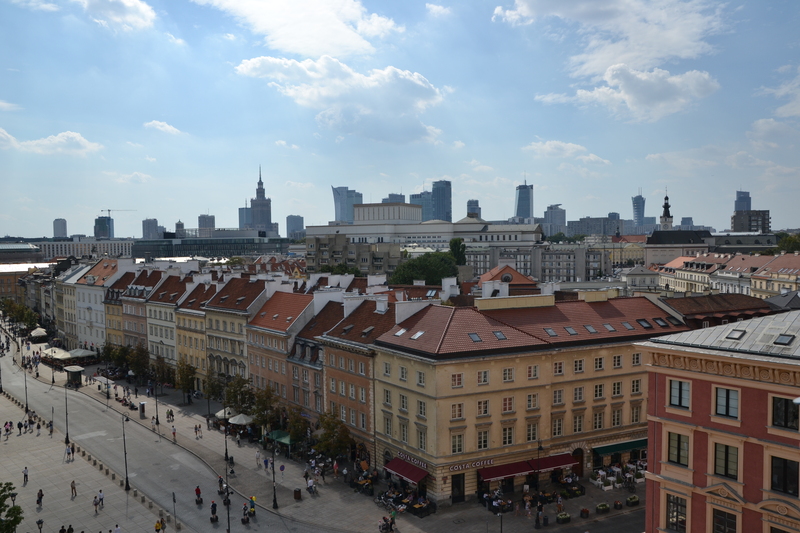 Where to find and access this view will be revealed in next week’s post (Warsaw, Poland Part II). Just as suggested immediately above, I have a whole load of other amazing things to share with you about Warsaw, and I do promise that they will be delivered to you soon! But I must stop here before the word count gets too out of hand. So, for the moment, I would like to say dziękuję – thank you – for stopping by, and I hope you look forward to checking out Warsaw, Poland Part II just as much as I look forward to sharing it. Warsaw, Poland Part II has been published. Check it out by clicking here! Wonderful post! “A story of rebirth” is such a perfect way to describe this beautiful city. Thank you so much! And yes, whoever wrote the Warsaw article for Lonely Planet nailed it. Wonderful article. My experience in Warszawa was very short so unfortunately I didn’t get to see much. But I would definitely recommend the Museum of the History of the Jews next time you’re there! Thank you for the comment! It is a “must” on my list. We only got to spend a day in Warsaw but would love to go back. We were lucky enough to spend a couple of amazing days in Krakow (with the biggest city square I have ever seen). Have you spent time there? Thank you for the comment! I haven’t spent as much time in Kraków as I have in Warsaw, but I have been there a couple of times. It is BEAUTIFUL!